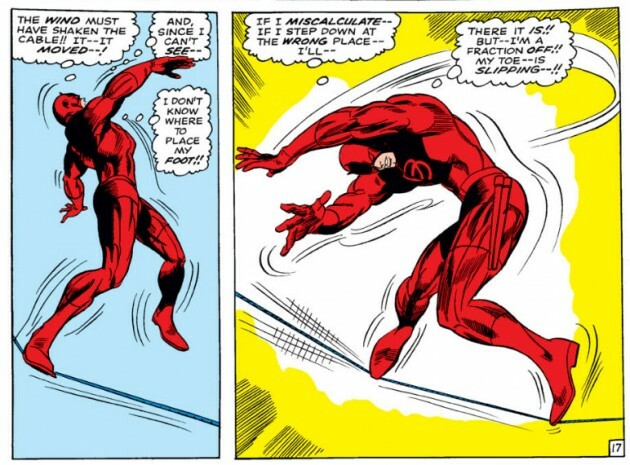 I’ve spent quite a bit of time over the past few days looking at old Gene Colan issues of Daredevil in search for those perfect moments that would best capture his art. I found the task a nearly impossible one. The moments are too many and too varied to boil down to just a few to represent his whole body of work. In the end, the panels I did select (listed in chronological order at the bottom of the post) are just examples to highlight some of the things that come to my mind when I think of his long stint on Daredevil, which began with Daredevil #20. I could have chosen others that would have served equally well in illustrating my point, however unique each scene and panel is. During the early years, Daredevil was a hero who clearly very much enjoyed running around town and punching bad guys. This joy and sense of freedom came across perfectly in Colan’s art. 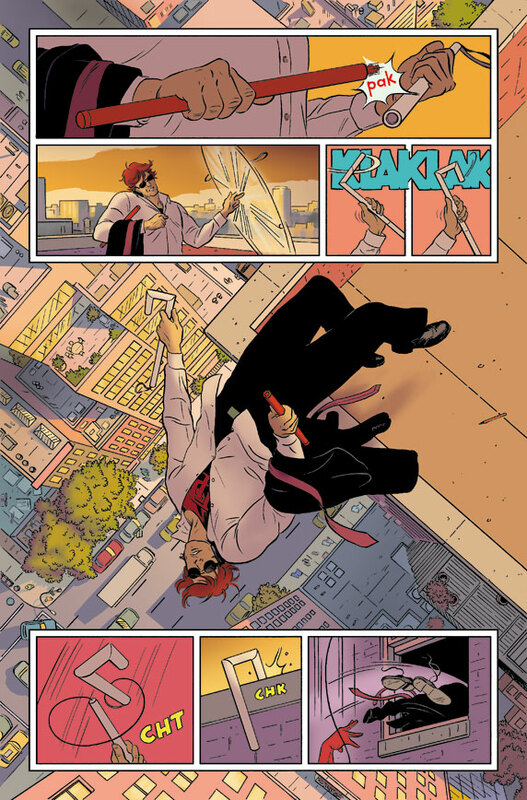 It’s like you can see the bounce in Daredevil’s step and the momentum in his swinging at the end of his billy club cable like a pendulum shot out of a cannon. Rest in peace, Gene Colan, and thanks for all the good times. You will never be forgotten. Why walk when you can use the city as an obstacle course? 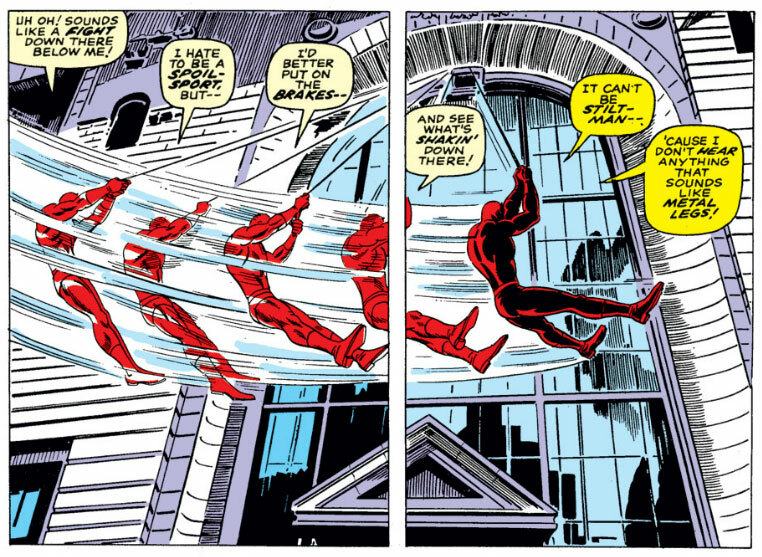 This panel from Daredevil #26 (written by Stan Lee) sees Daredevil jumping over a statue. Doesn’t it look like the most natural thing in the world? I love this panel, from Daredevil #27. I like the perspective from below, how the scene is broken up into two panels, the movement across the page and, last but not least, how Daredevil spreads his legs to reduce his speed at the end of the arc. Who’s got time for phone booths? 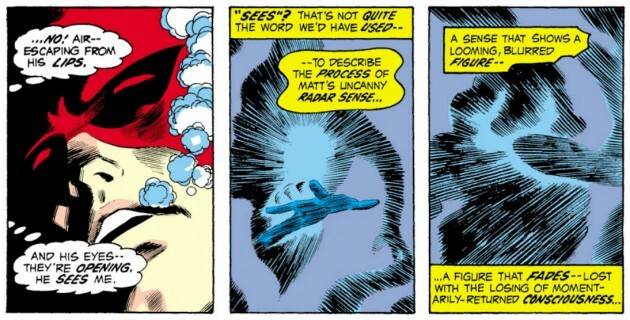 Does this scene (also from Daredevil #27) look familiar? I think Paolo Rivera must have been channeling some Gene Colan in this piece of preview art. 😉 Anyway, it’s a wonderfully classic high altitude wardrobe change and it definitely has me smiling. This scene is from Daredevil #31 which saw Matt temporarily lose his radar sense in the middle of the Mike Murdock era. As a result, here is a very blind Daredevil attempting some daring acrobatics. In Daredevil #81, written by Gerry Conway, Daredevil is introduced to the mysterious Black Widow, but he doesn’t know it yet. She rescues him from the bottom of the ocean while he’s unconscious. This scene is interesting enough in that it marks the beginning of the relationship between these characters, but I’ve included it here for the interesting radar effect. The vast majority of Colan’s Daredevil work took place during the 60’s and 70’s, but he had more recent contributions on his resume as well. 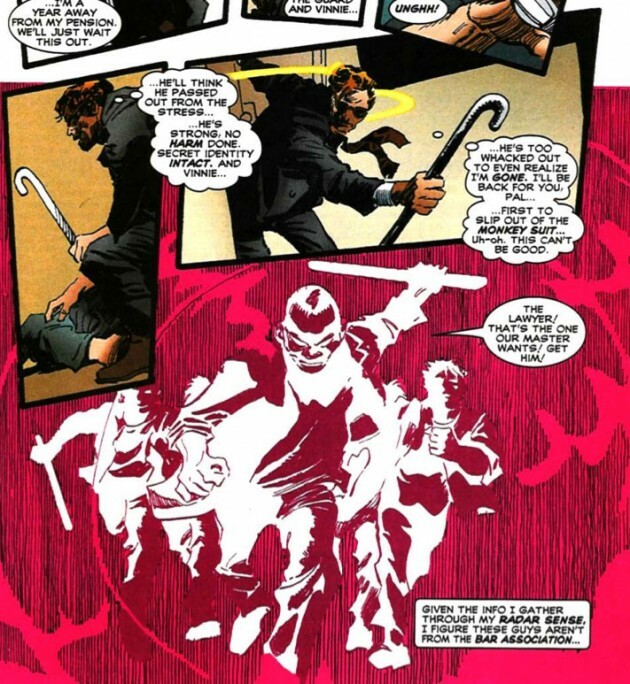 Below is a scene from Daredevil #366, written by Joe Kelly. Again, it was the radar effect of this page that caught my attention. Some good choices, but I would’ve included DD #20, page 17, the full-page spread when DD comes bursting thru the door of the Owl’s hideout. The way Gene has Daredevil leaning forward makes it look like he’s coming right at you. Also, issue #32, the fight scenes “in the dark” with Hyde and Cobra. One thing’s for sure, Mr. Colan was never dull! Well done. I for one could never have picked just a few moments. 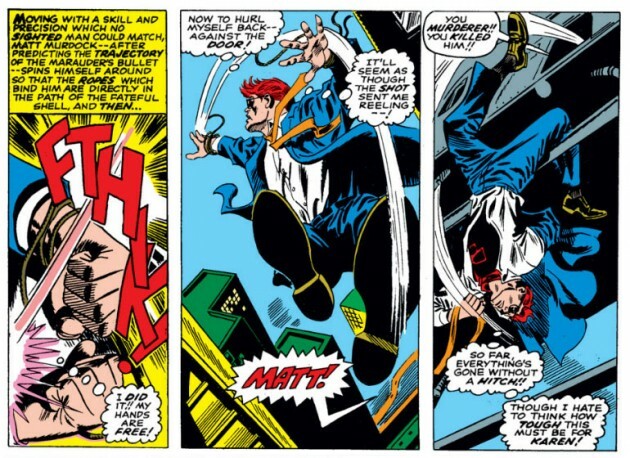 With all the years Gene spent on the book he was consistently creative and had a knack for highflying action. In my opinion his work was extremely informing, even after Miller re-imagined DD a bit. If you can’t tell, I’m a bit bias and was a huge fan. I haven’t read much of Colan’s work on DD, but his take on Black Widow is pretty much legendary, with every artist after him trying to imitate him. I was surprised you didn’t include at least one full panel of Natasha. Other than that, these look really fun and well thought out. Not sure if this very belated comment will be noticed, but I just found this post. I think you made some great choices, but I’m biased — I have the original art for two of your images! Gene’s Daredevil work was a highpoint in comic art, especially when he was well inked. Thanks! Pingback: Podcast de ELHDLT: Guía de apoyo del Especial Número 50. - Es la hora de las tortas!! !